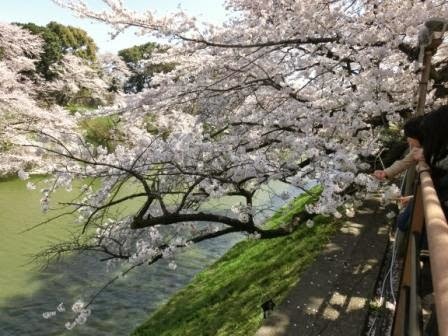 From my point of view, Tokyo’s leading cherry blossom spots are two; One is Ueno Park, and the other is Chidorigafuchi. These 2 places are musts for a blogger like me. 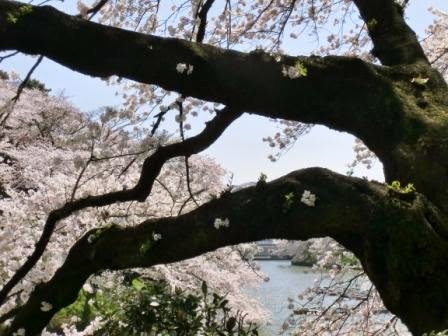 So I hope to concentrate to photos, travel information such as how to get there, Google Maps, and so on, at the bottom of this post, and a comparison with the other greatest sakura spot Ueno Park. Back to basics, Chidorigafuchi is a district around Imperial Palace. In case the pronunciation is too difficult because of languages, just remember it as Imperial Palace. 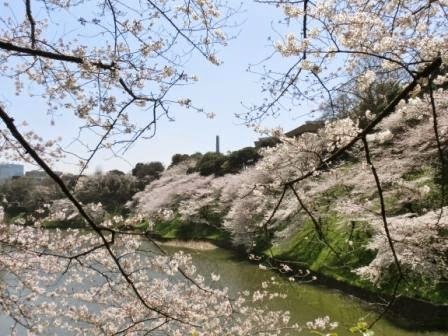 Hundreds of cherry trees are around the moat, so it has been a famous sakura viewing place for a long time. As far as I see it, the differences between Ueno Park and Chidorigafuchi are the following. You feel more of “Japanese” atmosphere with the palace gate, etc. 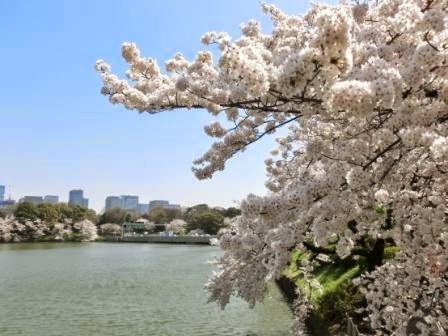 You can get so close to cherry blossoms themselves – If you are a photographer who want to shoot the blossoms rather than views, I suppose you can take photos freely from many different angles. When you turn left on the way to the main part of Chidorigafuchi, you’ll easily find this gate. It is the gate to Nippon Budokan (Meaning, “Japan martial arts stadium.” Competitions of judo, kenodo and other martial arts, and concerts of very popular musicians, both domestic and international, are held here.) Kitanomaru Park. Imperial Palace was once a castle of a samurai clan, so just a gate is very Japanese and samurai-like. And you will see this, too. Tokyo Tower, which has been the icon of Tokyo for decades. In Ueno, we see Tokyo Skytree, the new symbol of Tokyo. Some of you think that you have seen this photo; It’s Tokyo Direct Guide/Diary’s Facebook, Twitter, Flickr, and Tumblr (tumblr is just opened) cover photo. No, this is a new photo taken this year! I took a better photo in the very same spot in Chidorigafuchi. If you are interested, you can see the old cover photo on Facebook. Tokyo Tower is bright red, but it is not so because the air is foggy in spring in Japan. 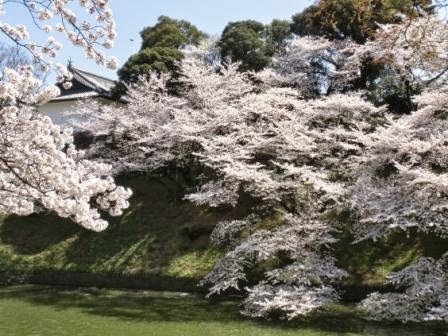 You can get a free official guidebook with English maps during the sakura festival. The first photo of this post is the most iconic place in Chidorigafuchi; It is on your left on the deck for views. But when you see your right from the deck, the view is wide and wonderful, too! 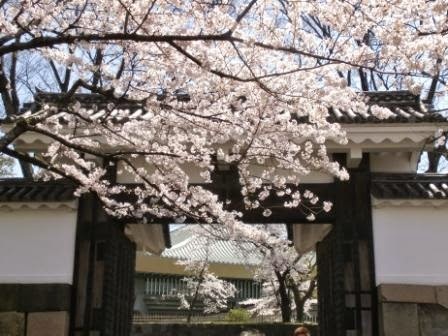 Well, I said that Chidorigafuchi may be a better place for photographers who hope to shoot blossoms than Ueno Park. The reason is that you can get so close from 360 degrees freely. You don’t need to care about the direction of sun lights anytime because you can move around a cherry tree. 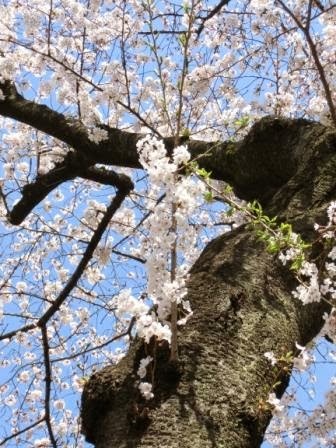 Moreover, you can get close to cherry blossoms blooming in minor places. How about a thin branch? I recommend Chidorigafuchi and the district around Imperial Palace. I recommend Ueno Park & Shinobazu Pond. Of course, it’s a great idea to visit BOTH!! 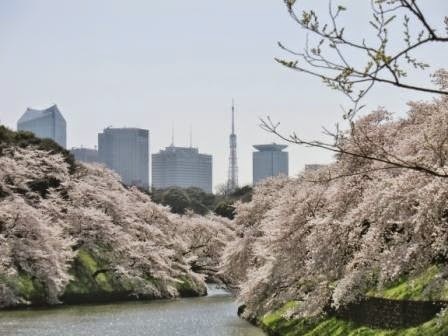 Browse Ueno Park, and other great places, and compare. Just enjoy photos. And when you really visit Chidorigafuchi, all the tourist information you want to know is at the bottom of this post. Keep it in your mind and have a great time!! The nearest station is Kudanshita. Tozai Subway Line, Hanzomon Subway Line and Shinjuku Subway Line have Kudanshita Station. First, see The Easiest JR Train Map to learn the outline of Tokyo City, and then see The Easiest Subway Maps to find Kudanshita. So if you are in Tokyo Station, take Tozai or Hanzomon Subway Line from Otemachi, which is connected to Tokyo Station. If you are in Shibuya, take Hanzomon Subway Line. If you are in Shinjuku, take Shinjuku Subway Line. Hotels near Tokyo Station – Imperial Palace is near Tokyo Station. There are 5-Star fabulous hotels there and some feature the breathtaking views of Imperial Palace. They include Shangri-La Hotel Tokyo, Four Seasons Hotel Tokyo at Marunouchi and retro & modern The Tokyo Station Hotel. 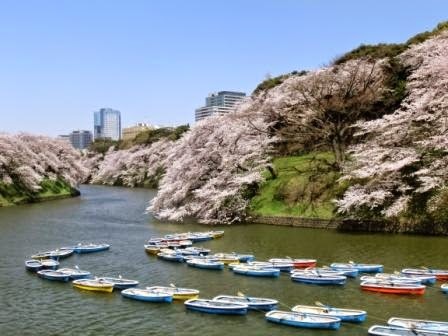 ← Sakura Matsuri (Cherry Blossom Festival) Ueno, Japan – Why You Shouldn’t Miss Shinobazu Pond! Wow! I LOVE the cherry blossom! One day I hope to see it – and if I do, I will take your advice and visit BOTH!! Have a great weekend, my friend! I really feel that famous places have reasons to be famous. 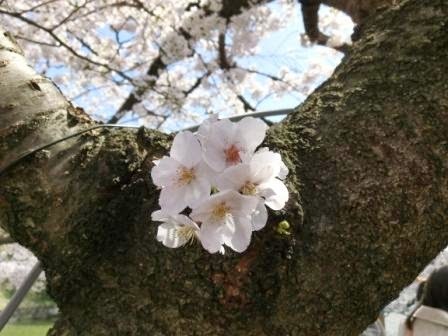 I love these 2 cherry blossoms spots very much, and you know, that's why I can write much about them. Have a good day to you, too! !